When the Soviet Union disintegrated, one might have expected Central Asia to become a natural region of rivalry between Moscow, which could no longer exercise formal political control over the region, and Beijing, whose rising power was no longer contained by a sealed Soviet border reinforced by powerful armed forces. But China and Russia have thus far cooperated considerably more than they have competed in Central Asia.1 Indeed, though China has kept its distance from the Russian conflict with NATO and the Russian military operation in Syria, and Moscow and Beijing have yet to cooperate beyond rhetoric and symbolic gestures in Africa, the Americas, or even Asia, Central Asia stands out as the region of the world where Beijing and Moscow cooperate most in pursuit of common goals. China and Russia have strived to develop Central Asia’s economic riches, especially energy and other natural resources. In addition to advancing their economic interests, they might hope that promoting prosperity in Central Asia could make its regimes more stable by reducing economic sources of popular alienation and generating more resources for their security forces. Watching the remarkable growth of the Chinese economy during this period, these former Soviet republics soon realized the value of, in President Vladimir Putin’s words, hitching a ride on China’s rising ship.4 The last decade has seen a surge in Chinese imports from these countries, an even greater growth in Chinese exports to many of them, and massive Chinese loans to support the construction of east-west transportation networks, including energy pipelines, that have provided the foundation for these growing Chinese-Central Asian economic ties. Perhaps to avoid alarming Russians and Central Asians, who can admire but also fear China’s rising power, the Chinese government has ceased pressing territorial claims against its Eurasian neighbors even while it has become more assertive regarding its other claims. The Chinese companies in Central Asian states have also tried to maintain low public profiles. Furthermore, the Chinese government has not sold major weapons systems to the Central Asian militaries, which traditionally have bought Russian and occasionally Western arms, or established military facilities in the region. The Russian government has tried to sustain its military primacy in Central Asia without Chinese support and in the face of the Western military drawdown; yet whether its armed forces, preoccupied with Syria and Ukraine, and its economy, weakened by depressed global commodity prices and Western sanctions, can generate sufficient capacity to sustain the region’s security in the face of potentially rising transnational threats is unknown. One reason why Central Asia has been a pocket of partnership in an otherwise constrained Sino-Russian alignment is that Beijing and Moscow have thus far had overlapping interests there that they can achieve without mutual conflict, including: preventing international terrorism, drug trafficking, and other transnational threats; averting social revolutions and mass disorders in Central Asia; exploiting the region’s economic resources, especially oil and gas deposits and transportation conduits; and constraining the local elites from aligning with other extra-regional partners, limiting Western influence there and, conversely, inducing them to follow their diplomatic direction. Other factors have kept the China-Russia interaction generally positive, including that Beijing has assigned less strategic significance to the region than Moscow; that the Central Asian governments profess multi-vector foreign policies despite, in several cases, maintaining formal defensive alliances with Moscow, and that both, suffering from strained ties with many other neighbors, have tried to avoid policies that threaten the other’s interests. Russia still benefits from the substantial economic ties that Moscow built with the Central Asian republics in the Soviet era. For example, many Central Asian laborers still work in Russia, while at least one Russian firm can usually be found participating in any large business project in the region. Moscow can leverage migrant remittances (and threats of curtailing them) as another economic tool of influence. Until recently, remittances from Tajik laborers in Russia accounted for almost half of Tajikistan’s GDP, while four-fifths of the Tajik nationals who worked in Russia had dependents in Tajikistan who relied on the remittances as essential income.26 The Russian economy also benefited from paying these laborers wages that averaged 19 percent below those of their Russian counterparts.27 Russia has now elevated the importance of consolidating economic ties with the region and seeks to incorporate these states into its vision of a single, shared economic space reminiscent of that of the Soviet Union. This project is centered on their common customs union and the newer Eurasian Economic Union (EEU), supplemented by bilateral arrangements, such as Gazprom’s assumption of control over Kyrgyzstan’s natural gas market in 2014.28 Moscow has denied that it seeks to exclude other countries from participation in Central Asian trade, though Russian sanctions and other measures have erected barriers to Western economic activity in the region. At times, Chinese and Russian companies have competed over the production and export of Central Asian oil and gas supplies, but more often they have focused on different market segments or have arranged that at least a few Russian firms profit from the exploitation and shipment of Central Asian energy supplies to China. Russian policymakers generally see Chinese investment and commerce in Central Asia as promoting economic growth that indirectly helps Russia by reducing resource demands on Moscow and by furthering political stability on Russia’s vulnerable southern front. Russia also lacks the economic power to thwart Chinese commercial projects that enjoy the backing of local elites, even if the Central Asian populations remain uneasy with the growing Chinese presence. India, Japan, and South Korea are aspiring to increase their economic presence in the region, but at best they can only dampen China’s growing economic primacy in Central Asia. China and Russia both profess to practice a policy of non-interference in the internal political affairs in Central Asia (and elsewhere). If they have not objected to the fleeting democratic trends seen in Kyrgyzstan, they have certainly not supported them there or elsewhere. More importantly, they have both sought to limit the influence of other extra-regional powers in Central Asia as well as demand that Central Asian leaders respect core Chinese and Russian interests. For example, Beijing has insisted that the Central Asian governments support China’s position regarding Taiwan, Tibet, and Xinjiang as well as other issues of vital concern to it. The Kremlin, meanwhile, has warned these states against aligning too closely with the West, especially on security issues. Although Beijing and Moscow have tolerated the Western military and commercial presence in Afghanistan and Central Asia, they have sought to prevent the United States from using this buildup as a means to contain or pressure China and Russia. Beijing’s concerns have been most evident in the excuses China has made not to support the NATO military intervention in Afghanistan, directly or even logistically, such as allowing the Pentagon to send non-lethal supplies through Chinese territory to the NATO forces fighting in Afghanistan.29 Russian unease at the NATO presence was even more evident. Moscow engaged in bidding wars with Washington over how quickly to end the US air force base at Manas, pressured Central Asian governments to eschew collaboration with Western intelligence agencies, and orchestrated a media campaign implying that Western interests were seeking to maneuver Central Asians into conflicts with Iran, exploit their natural resources, and subvert their governments under the pretext of promoting democracy and human rights. Nonetheless, the Chinese and Russian governments have cooperated with the Western powers on some issues related to the region, such as repatriating potentially dangerous nuclear materials and promoting regional efforts to achieve a diplomatic settlement to the war in Afghanistan. Since then, China, which provided little economic aid in the 1990s, has become the main creditor to the Tajik state as well as a leading trading partner and investor in other Central Asia states. Beijing has leveraged these assets to secure economic and other benefits from these states, but also faces barriers in each country. For example, Tajikistan is eager to develop economic ties with China since remittances from Russia have been decreasing precipitously during the past year due to Russia’s weakening economy and stricter immigration laws.34 However, China would not welcome Tajik guest laborers, and its companies prefer to hire Chinese laborers and managers, even for projects in Central Asia. The Chinese are willing to fund long-term infrastructure projects in Central Asia that the Russian government cannot afford and private Western companies typically eschew. Chinese authorities have refrained from leveraging these economic assets to gain military facilities in Central Asia, which Beijing clearly sees as falling within Moscow’s security sphere, a state of affairs that Chinese leaders prefer to continue. Russian leaders also want their country to remain the main security provider for the region. China has not discouraged the Russian military buildup in the region or the CSTO’s expanding powers and has restrained its sale of arms to Central Asian militaries. 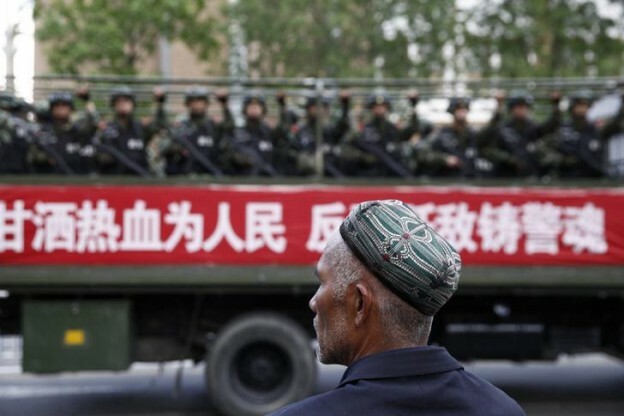 The main threats to China in Central Asia—the “three evil forces” of regional terrorism, religious extremism, and ethnic separatism—are asymmetric and transnational, best addressed by good intelligence, law enforcement, and other non-military tools. In the case of Afghanistan, Beijing benefits from having ties with the Pakistani security establishment, which can influence the Taliban and discourage some terrorist groups from attacking Chinese nationals, economic assets, or territory, though Islamabad exercises little influence in Central Asia. China has been making efforts to win soft power approval of Central Asians through regional economic and cultural ventures. For example, Chinese officials characterize their Silk Road vision for the region not simply as the launch of large-scale economic partnerships that build upon existing projects, but as a genuinely new phase of greatly expanded regional cooperation with Central Asia, Russia, and other countries in Eurasia.35 In February 2015, China’s State Council established a USD 40 billion Silk Road Fund to provide additional financial support for this strategy.36 The Russian government has publicly backed Beijing’s Silk Road Economic Belt as harmonizing with its own regional economic aspirations.37 Chinese state-controlled institutions have already established extensive academic and other exchange programs for Central Asian students to study or work in China, resulting in a growing number of Central Asians pursuing higher education there.38 Still, it will take a long time before Beijing can match Moscow’s media dominance or for the Chinese language to rival Russian as the lingua franca. Ironically, these differences have made the SCO more valuable to China and Russia, since the organization provides an institutional framework to reassure them about each other’s overlapping activities in Central Asia. In the core SCO documents, the members pledge to avoid interfering in one another’s internal affairs, to comply with transparency and confidence-building measures, and to support each other against common transnational threats. China values the SCO as a means to lessen Russian alarm about its expanding influence in Eurasia; for example, Beijing characterizes its bilateral loans and security exercises with Central Asian partners as occurring within the SCO framework, rather than as bilateral Chinese initiatives. Russian officials have not challenged this purported SCO label, though it is hard for outside observers to discern any concrete role for the organization, which lacks major organic economic bodies. Russia has also tried to use the organization as a way to make Chinese activities in Central Asia more transparent and constrain them. These Sino-Russian differences reassure Central Asians by minimizing the dangers of the SCO institutionalizing a China-Russia condominium over them, while the organization provides them with a means to avoid bargaining one-on-one with Moscow or Beijing on some issues. In general, Beijing and Moscow have managed their SCO-related differences, which have been declining in the past year as Russia has relaxed its constraints on cooperating with China. The two governments have also shown solidarity regarding the establishment of the new Asian Infrastructure Investment Bank (AIIB), which will help finance large-scale Eurasian integration projects, and the recent augmentation of the BRICS bloc, which in 2015 launched a New Development Bank (NDB) that aspires to finance joint projects as an alternative to the Western-led World Bank and the International Monetary Fund. Chinese and Russian officials are concerned about Afghanistan’s security, which could decisively affect their integration plans for Central Asia. For the past dozen years, Beijing and Moscow have largely been able to free ride on the US-led, NATO-supported coalition military campaign in Afghanistan and related Western security and economic efforts in Central Asia. Now, the Western civilian and military presence in the region is rapidly decreasing. Even though Washington and NATO keep postponing the date when they will withdraw all their combat troops from Afghanistan, and the Taliban is rife with division, the insurgents successful attacks against Kunduz, Kandahar, and Kabul in the second half of 2015 confirm the inability of the Afghan National Security Forces to protect the country’s border regions with Central Asia. Meanwhile, the prospects of the entire Taliban agreeing to a peace settlement, never high, have become even more remote given the movement’s divided leadership and fears of being outflanked by the even more militant Islamic State group. The leaders of China and Russia are now pondering whether they can keep their Afghan-related commitments marginal and continue to cooperate broadly, if not deeply, in Central Asia (even as Beijing builds its economic presence in Eurasia and Moscow consolidates its institutional building in the former Soviet republics). In particular, Chinese policymakers must weigh whether they can still rely on Russia’s decreasing capabilities to protect Chinese interests in the region. Putin has made retaining influence in Central Asia one of his highest priorities given his perception of Russia’s core sphere of influence. Russia’s increasing regional military presence has occurred with the support of the governments of Kyrgyzstan, Tajikistan, and Kazakhstan, which rely on Moscow to help them counter foreign and domestic non-state threats. The governments of Uzbekistan and Turkmenistan have been able to avoid joining Moscow-backed regional economic and security initiatives, but lack the means to otherwise constrain them and do cooperate with Russia through bilateral arrangements. Even before Moscow’s annexation of Crimea in March 2014, Russia has sought greater cooperation with China as it finds itself increasingly isolated from the West. The two states have announced various enhanced bilateral cooperation initiatives, though moving from joint declarations of intent to concrete joint projects has proven elusive. Whereas Moscow wants to exercise considerable control over the security policies of the Central Asian governments, Beijing is comfortable simply averting certain worst outcomes, such as regional terrorism or state failure. Since the onset of the Ukraine crisis, Sino-Russian differences with respect to Eurasia’s institutional architecture have narrowed. Beijing has become more tolerant of the growth of the Moscow-led EEU and CSTO, while Moscow has recently relaxed constraints on the SCO’s economic activity while accepting its value as a security structure focused on counterterrorism.43 Beijing’s acquiescence in India’s full SCO membership suggests that Chinese policymakers have become more confident in their ability to advance their Eurasian interests, particularly due to China’s still-growing economy and Russia’s Ukraine-driven weakness and isolation. Beijing now relies less on the SCO to project its regional influence due to the advent of multinational institutions more tightly under its control, such as the AIIB and Silk Road Fund. China and Russia have recently stated that they would reconcile their otherwise rival Central Asian integration projects, the Silk Road Economic Belt and the EEU.44 As shown by Beijing’s tolerant attitude toward Moscow’s separatist activities in Ukraine, neither China nor Russia wants to take actions that would antagonize the other at a time when their relations with many of their other neighbors are so troubled. Nonetheless, the vacuum resulting from the decreasing Western military presence in the region, combined with Russia’s economic weakness and China’s growing power and Central Asian equities, could drive Beijing (whose leadership has already crossed traditional red lines against Chinese foreign activism) to elevate its role in Central Asia regardless of Russian preferences. A downturn in China-Russia relations or a loss of Beijing’s confidence in Moscow’s ability to maintain security in Central Asia, which would jeopardize its Eurasian economic and security interests, could lead China to abandon its policy of regional deference. In addition to Afghan-related developments, such as the rise of transnational or Uighur-directed terrorism there, it is conceivable that Russia and China might back competing factions in a Central Asian presidential succession scenario, making these countries a more explicit target of the China-Russia rivalry. In the end, an isolated Russian leadership, the product of Putin’s grandiose regional aspirations and domestic political imperatives, may have to swallow Chinese regional primacy in much of Central Asia, which Moscow lacks the means to prevent short of unacceptable military measures. Cooperative rather than conflict scenarios between China and Russia in Central Asia are still more likely in the next few years, but a regression of the Sino-Russian relationship to its troubled historical mean even there cannot be excluded. *The author would like to thank Rosario Bagnato, Evangeline Clapp, Jamie Gody, Hagop Karabetian, Kathleen O’Rourke, and Ryan Steele for their research and editorial assistance with this article. 1. Zhao Huasheng, “China-Russia Relations in Central Asia,” The Asan Forum, Vol. 1, no. 6 (2013), http://www.theasanforum.org/china-russia-relations-in-central-asia/. 2. Bates Gill, “Shanghai Five: An Attempt to Counter US Influence in Asia?” Brookings Institution, May 4, 2001, http://www.brookings.edu/research/opinions/2001/05/04china-gill. 3. Richard Weitz, “The Shanghai Cooperation Organization: A Fading Star?” The Asan Forum 2, no. 4 (2014), http://www.theasanforum.org/the-shanghai-cooperation-organization-a-fading-star/. 4. “Russia and the Changing World,” RT, February 27, 2012, https://www.rt.com/politics/official-word/putin-russia-changing-world-263/. 5. “Putin Says CIS States Could Create Border Force For Crises,” Radio Free Europe/Radio Liberty, October 16, 2015, http://www.rferl.org/content/putin-cis-states-border-force/27310104.html. See also Sneha Shankar, “ISIS Threat To Central Asia Has Increased, Russia’s Intelligence Chief Warns: Report,” International Business Times, October 28 2015, http://www.ibtimes.com/isis-threat-central-asia-has-increased-russias-intelligence-chief-warns-report-2159955. 6. Beina Xu, Holly Fletcher, and Jayshree Bajoria, “CFR Backgrounders: The East Turkestan Islamic Movement (ETIM),” Council on Foreign Relations, September 4, 2014, http://www.cfr.org/china/east-turkestan-islamic-movement-etim/p9179. 7. Ankit Panda, “Afghanistan Transfers Captured Uyghur Militants to China,” The Diplomat, February 24, 2015, http://thediplomat.com/2015/02/afghanistan-transfers-captured-uyghur-militants-to-china/. 8. Niklas Swanström, “The Security Dimension of the China-Central Asia Relationship: China’s Military Engagement with Central Asian Countries,” Institute for Security and Development Policy, March 18, 2015, http://www.uscc.gov/sites/default/files/Swanstrom%20Testimony_3.18.15.pdf. 9. Cui Jia, “Special unit to help China fight cyber terrorism,” chinadaily.com.cn, June 7, 2014, http://www.chinadaily.com.cn/china/2014-06/07/content_17569838.htm. 10. “China to boost anti-terror cooperation with Central Asia,” Reuters, June 10, 2014, http://uk.reuters.com/article/uk-china-security-idUKKBN0EL05G20140610. 11. Michael Lelyveld, “China Eyes Russia’s Central Asian Role as it Considers Energy Interests,” Radio Free Asia, November 9, 2015, http://www.rfa.org/english/commentaries/energy_watch/china-centralasia-11092015103136.html. 12. Reid.Standish, “Shadow Boxing With the Islamic State in Central Asia,” Foreign Policy, February 6, 2015, http://foreignpolicy.com/2015/02/06/shadow-boxing-with-the-islamic-state-in-central-asia-isis-terrorism/. 13. “Syria Calling: Radicalisation in Central Asia,” Briefing N°72, International Crisis Group, January 20, 2015, http://www.crisisgroup.org/en/regions/asia/central-asia/b072-syria-calling-radicalisation-in-central-asia.aspx. 14. Brian Michael Jenkins, “The Dynamics of the Conflicts in Syria and Iraq and the Threat Posed by Homegrown Terrorists and Returning Western Fighters” (testimony submitted before the House Foreign Affairs Committee and House Homeland Security Committee on November 18, 2015, RAND Corporation), http://www.rand.org/pubs/testimonies/CT443.html. 15. Bureau of Counterterrorism, “Country Reports on Terrorism 2014,” US Department of State, June 2015, Chapter 2, http://www.state.gov/j/ct/rls/crt/2014/239408.htm. 16. “Chief of the General Staff of the Russian Armed Forces Spoke about Military Dangers and Threats to Russia in Modern Conditions,” Ministry of Defense of the Russian Federation, April 16, 2015, http://eng.mil.ru/en/mcis/news/more.htm?id=12016242@egNews. 17. “China’s Xi Proposes Security Concept for Asia,” Xinhua, May 21, 2014. http://www.chinadaily.com.cn/china/2014-05/21/content_17531900.htm. 18. Konstantin Parshin, “Tajikistan: Russia Angling for Return to Tajik-Afghan Frontier,” EurasiaNet, March 1, 2011, http://www.eurasianet.org/node/62979. 19. Richard Weitz, “SCO Military Drills Strengthen Russian-Chinese Regional Hegemony,” The Central Asia-Caucasus Analyst, October 1, 2014, http://www.cacianalyst.org/publications/analytical-articles/item/13054-sco-military-drills-strengthen-russian-chinese-regional-hegemony.html. 20. “Interview by Special Presidential Envoy for International Cooperation in Combating Terrorism and Transnational Organised Crime Alexander Zmeyevsky to the TASS News Agency, 30 December 2014,” Ministry of Foreign Affairs of The Russian Federation, December 30, 2014, http://archive.mid.ru//brp_4.nsf/0/66812FB40D560E11C3257DBF00239382. 21. Lauren Dickey, “China Takes Steps Toward Realizing Silk Road Ambitions,” China Brief, June 4, 2014, http://www.jamestown.org/programs/chinabrief/single/?tx_ttnews%5Btt_news%5D=42466&tx_ttnews%5BbackPid%5D=25&cHash=ccf68aa4529c12f2ba3238b309e84ea8#.U53bfulOWWw. 22. Aleksei Volynets, “Tadzhikistan v teni Kitai,” Russkaya Planeta, December 8, 2014, http://rusplt.ru/world/tadjikistan-v-teni-kitaya-14772.html. 23. Michael Clarke, “Why is Xinjiang violence escalating?” BBC News<.em>, May 23, 2014, http://www.bbc.com/news/world-asia-china-27534049. 24. US-China Economic and Security Review Commission, 2015 Annual Report to Congress, Washington, DC, November 17, 2015, 396-399, http://www.uscc.gov/Annual_Reports/2015-annual-report-congress. 25. Kemel Toktomushev, “Central Asian Bazaars as A Soft Power of Beijing,” China-US Focus, December 7, 2015, http://www.chinausfocus.com/finance-economy/central-asian-bazaars-as-a-soft-power-of-beijing/. Uncertainties,’’ World Bank Economic Update 1 (Spring 2015); Ibid., 401. 27. Irina Umarova an Jamila Sujud, “Tajiks Face New Obstacles to Work in Russia,” Institute for War and Peace Reporting, January 23, 2015, https://iwpr.net/global-voices/tajiks-face-new-obstacles-work-russia. 29. Richard Weitz, “China and Afghanistan After the NATO Withdrawal,” Jamestown Foundation, November 2015, http://jamestown.org/uploads/tx_jamquickstore/China_and_Afghanistan_After_the_NATO_Withdrawal.pdf. 30. “Charter of the Collective Security Treaty Organization of October 07, 2002,” CSTO, October 10, 2002, http://www.odkb-csto.org /documents/detail.php?ELEMENT_ID=1896. 31. See the news reports at “Novosti ODKB,” CSTO, http://www.odkb-csto.org/. 32. Abdujalil Abdurasulov, “CIS Summit: Russia to bolster Central Asia military,” BBC News, October 16, 2015, http://www.bbc.com/news/world-europe-34538051; and Matthew Stein, “Compendium of Central Asian Military and Security Activity,” Foreign Military Studies Office, Fort Leavenworth, May 22, 2015, 5, http://fmso.leavenworth.army.mil/documents/Central-Asian-Military-Events.pdf; and Russian attack helicopters to be moved to military base in Tajikistan,” Tass Russian News Agency, October 7, 2015, http://tass.ru/en/defense/826851; and “ODKB v Tadzhikistane otrepetiruet otrazhenie ugrozy iz Afganistana,” Lenta.ru, May 18, 2015, http://lenta.ru/news/2015/05/18/tajik/. 34. Mikhail Overchenko, “Tadzhikistan privlechyet $6 mlrd. Kitaiskikh investitsii,” Vedemosti, October 10, 2014, http://www.vedomosti.ru/finance/articles/2014/10/22/tadzhikistan-privlechet-6-mlrd-kitajskih-investicij. 35. Feng Yujun, “China’s Silk Road visions bring cooperation, not conflict, to region,” The Global Times, February 17, 2014, http://www.globaltimes.cn/content/842985.shtml#.UwLVy-mPJEo. 36. US-China Economic and Security Review Commission, 397-398. 37. See for example Vladimir Putin’s Address, 70th session of the UN General Assembly (address before the plenary meeting of the seventieth session of the UN General Assembly in New York, September 28, 2015), http://en.kremlin.ru/events/president/news/50385. 38. Bruce Pannier, “How Far Will China Go in Central Asia?” Radio Free Europe/Radio Liberty, June 8, 2015, http://www.rferl.org/content/qishloq-ovozi-chinese-influence-growing-roundtable/27060377.html. 39. “China welcomes SCO expansion, calls for upholding ‘Shanghai Spirit’,” Xinhua, July 11, 2015, http://news.xinhuanet.com/english/2015-07/11/c_134402081.htm. 40. Bruce Pannier, “Are the Central Asians the Losers in SCO Expansion?” Radio Free Europe/Radio Liberty, July 17, 2015, http://www.rferl.org/content/central-asia-sco-expansion-/27134212.html. 41. The author is executive director of the Strategy Study Center, China Foundation for International Studies, and China’s former senior official to APEC. 42. Joshua Kucera, “CSTO to Cut Contacts with NATO, Increase Ties with SCO,” EurasiaNet, April 24, 2014, http://www.eurasianet.org/node/68303. 43. “Russia, China Should Boost Potential of Regional Organizations–Russian Security Council,” RIA Novosti, June 6, 2014, http://en.ria.ru/russia/20140606/190392662/Russia-China-Should-Boost-Potential-of-Regional-Organizations-.html. 44. Uma Purushothaman, “China and Russia step up cooperation in Central Asia,” East Asia Forum, June 9, 2015, http://www.eastasiaforum.org/2015/06/09/china-and-russia-step-up-cooperation-in-central-asia/.